Every single time I hear an announcement for a new Jennifer Echols book, I get really hopeful. I’m always looking for the next Going Too Far. However, her newer releases have failed to live up to my expectations. 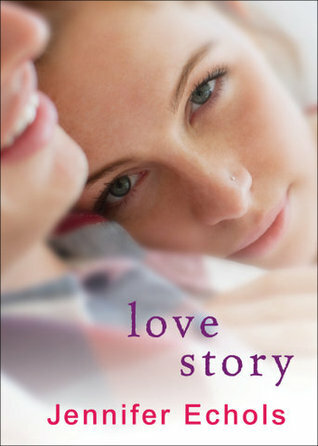 Not to say Love Story wasn’t an interesting read, I did like a lot of things about it. Unfortunately – the plot was not one of them. Erin is a new college freshman majoring in creative writing. She vents her crush on her family’s stable boy, Hunter, by writing a romance novel starring her and Hunter. Unfortunately…Hunter turns up as the writing workshop’s new student. Uh oh. Now – all that is fine on its own. Sounds like an interesting beginning to a story, right? But then things go farther (too far) when we learn that Erin’s wealthy grandmother has disowned her for not majoring in business and, instead, given Hunter tuition money in exchange for his promise to come back and work at the family’s horse ranch. As the book continues, the Erin/Hunter dynamic turns into – in my opinion – a convoluted mess. Things end up even more complicated than they sound, which is no easy feat. Maybe Hunter isn’t so bad…no wait, he’s the devil…aww, I’ll forgive him…[insert sexytimes]…now he’s a traitor again….sigh. Well, I’m confused. By the time I neared the end of the book, I couldn’t wait to get through all the ridiculous drama so I could (hopefully) read a nice HEA and then go on with my life. Sadly, the ending (while not bad) was very abrupt. But, putting the plot aside, I did like Erin as a whole. She was interesting and kept the book moving swiftly (even when something nutty was happening). Also, I have to admit that Hunter is pretty swoon-worthy. The two had pretty great chemistry (despite the fact that I never quite figured out why they were even speaking to each other). I wish their lives could have been a little less complicated so I could have enjoyed their story more. So – if you’re a fan of crazy angst-ridden drama and/or Jennifer Echols – this might be the book for you. Otherwise, I would recommend reading (or re-reading) Going Too Far instead! right? I just could not figure out why she wanted to jump his bones instead of punching him in the face. Made no sense! Previous post: New Blog Layout!